The Hobonichi Techo daily planner, a brainchild of Japanese copywriter, TV personality and creator of the MOTHER series Shigesato Itoi and his company Hobo Nikkan Itoi Shinbun (Hobonichi), is back with a brand new lineup of stationary and accessories for 2017, including a selection that will most definitely be highly desirable to that crossover of MOTHER fans and regular Techo users. Following successful launches of MOTHER-themed designs over the last few years, Hobonichi are introducing three new styles of of planner covers inspired by the cult favourite RPG series. First up is ‘Memories‘, which focuses on some of the weird and wonderful locations the game’s four heroes venture to on their journey. As the Hobonichi website aptly puts it, “the sight of all these nostalgic places is sure to bring back lots of memories”, staying true to the cover’s name. Next up is ‘1994‘, which displays a motif inspired by the Super Famicom version of the game’s box art. 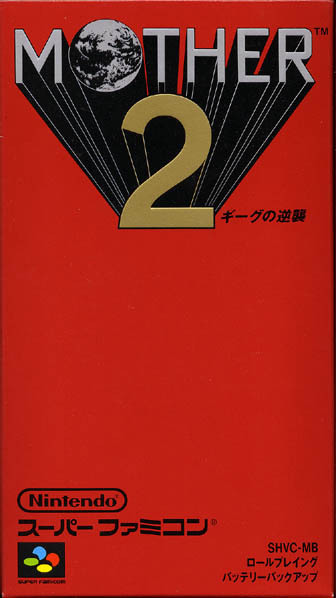 Itoi states the packaging design was inspired by Japanese chocolate bar wrapping, which shows through in its bold gold and silver logo on a strong red backing. This is a great way to show your appreciation for an iconic design missed out on by the west. The final design, simply named ‘Ness‘, comes in the form of a hardcover book released under the ‘Weeks’ range of weekly planners (as opposed to the Techo’s daily format). It feature’s MOTHER 2‘s protagonist in a variety of poses, printed on shiny blue necktie material. The sharp-eyed EarthBound fan might notice that some of the poses featured are actually exclusive to the Japanese version of the game. The latest version of Hobonichi’s Techo planner, as well as the wide range of covers and accessories available for it, are set to go on sale starting September 1st. Every order of a MOTHER Techo cover or Weeks planner contains a free large-scale Mr. Saturn sticker as an added bonus – in previous years, the MOTHER-themed covers have been some of the first to sell out, so keep a close eye on the Hobonichi Techo English website, where you can check out the full lineup of accessories. This entry was posted in Fashion, Merchandise, Posts and tagged Accessories, EarthBound, Fashion, Hobonichi, Merchandise, Mother, Nintendo, Shigesato Itoi. Bookmark the permalink.